The Huh? : Adventure Time Explore the Dungeon Because I DON'T KNOW! Review Because I Ugghh. Adventure Time Explore the Dungeon Because I DON'T KNOW! Review Because I Ugghh. Why is this game so bad?!? Explore the Dungeon takes place in a very generic, randomized floor design dungeon setting. Which, considering the cast of characters and the content they have at their disposal, sounds like a recipe for gaming gold, but it is far, FAR from that. It really shouldn't be hard to make a simple top-down dungeon-crawler, but somehow this got flubbed big time. Of all the playable characters (Jake, Finn, Marcelin, and Cinnamon Bun to start, with others unlocking as you play), they all play the same. There isn't anything to truly differentiate each character. It all comes down to going in and mashing the attack button. Occasionally getting a special move or sub-weapon to assist. Nothing original or imaginative to play with. Ok, I take that back, many of the sub-weapons had me laughing, but got to be as boring as the gameplay very swiftly. The Newt Poot cannon that shoots fart clouds, a Cone O' Nine Flavors to tastily flay enemies, and a gun that launches kittens are all entertaining, but work quite poorly. Only later in the game, when you find the very powerful sub-weapons is it really feasible to use. Marceline, however, desperately needs a melee sub-weapon because her main attack is so weak. You may have heard that there are 100 floors! Yeah, that sounds amazing! Except for the fact they are primarily empty. The simple addition of a run button could've at least helped a little. And the enemies you do happen to come across are all the same. Over and over, ad nauseam. What you don't really hear about is that they are broken into 20 floor themes- not too bad, but you can't leave without a great cost- if you hit a checkpoint (every 5th level) and you exit, if you don't spend all of your money you lose it. On top of that, if you happen to die before a checkpoint you lose half your gold and are automatically returned to the hub, thus forcing you to spend what little gold you have left. And to make that just a bit more like a punch in the nuts, you have to replay all the levels you missed before the checkpoint again. After losing your sub-weapon, half your gold, and any boost tokens you may have been using to pad your stats- replaying these levels becomes very irritating. I would also like to mention that because the leveling up costs so much, it becomes a grand slog to repeat the boring levels again to gain levels. Oh, yeah, I forgot, there is no exploring. It's drop in, walk to a stairwell which will be located at the farthest point from you on the map, repeat. Here's a bit of good to say- I do really like the music and voice work. They are top notch and hearing some of the things they say are quite hilarious. Lumpy Space Princess and her confidence about her appearance will cause a chuckle, and hearing Marceline's nonchalance always makes me smile. But these shouldn't be the best part of a game based on a show that continually tops itself with humor and imagination. This was a chance for game makers to do the show great justice and make an RPG to appeal to both the shows fans and to gamers. If WayForward would've focused on making something like all the dungeon-crawlers of old they may have done something great. This is sadly, a bland half-assed attempt at a game. As a fan of the land of Ooo, I must say this is a massive step backwards. The most difficult boss of this game is Monotonous Tedium. Unfortunately, this boss arrives quickly and persists in annoying the player right up until the end. 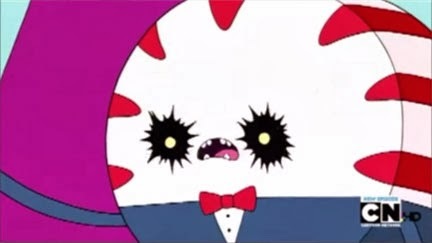 And I'm still a little peeved that Steam players get to play as Peppermint Butler for free. The game is already way overpriced, and paying more for a character I actually like in a terrible game just isn't worth it.